Perched on the confluence of four rivers and surrounded by green hills, Asahikawa combines a modern city experience with the pristine nature nearby. Kick off your visit on the 18th (Mon): admire nature's wide array of creatures at Asahiyama Zoo, then appreciate the extensive heritage of Asahidake Natural Hiking Route, then trek along Susoaidaira, and finally get engrossed in the history at Hokuchin Memorial Museum. Here are some ideas for day two: contemplate the waterfront views at Blue Pond, then take in the pleasant sights at Shikisai no Oka, and then stroll through Shinei no Oka Tenbo Koen. To find out how to plan a trip to Asahikawa, use our trip itinerary maker. Kuala Lumpur, Malaysia to Asahikawa is an approximately 14-hour combination of flight and train. You can also fly; or do a combination of bus and flight. Due to the time zone difference, you'll lose 1 hour traveling from Kuala Lumpur to Asahikawa. Prepare for much colder weather when traveling from Kuala Lumpur in November: high temperatures in Asahikawa hover around 2°C and lows are around 0°C. Finish up your sightseeing early on the 19th (Tue) so you can catch the train to Sapporo. A modern, bustling city known for its beer brewery, Sapporo attracts millions of visitors with its Snow Festival, during which elaborate ice and snow sculptures are exhibited all over town. When in Sapporo, make a side trip to see Otaru Canal in Otaru, approximately 46 minutes away. And it doesn't end there: tour the pleasant surroundings at Odori Park, get great views at Sapporo TV Tower, get into the urban bustle at Sapporo Underground Pedestrian Space, and wander the streets of Susukino. To see maps, traveler tips, photos, and other tourist information, read our Sapporo day trip planning website . Traveling by train from Asahikawa to Sapporo takes 1.5 hours. Alternatively, you can drive; or take a bus. Expect a bit warmer weather when traveling from Asahikawa in November: highs in Sapporo hover around 6°C, while lows dip to 3°C. Finish your sightseeing early on the 22nd (Fri) to allow enough time to travel to Hakodate. On the 23rd (Sat), take in the awesome beauty at Mount Hakodate, then take a stroll through Motomachi, then admire the striking features of Goryokaku Park, and finally enjoy breathtaking views from Goryokaku Tower. Get ready for a full day of sightseeing on the 24th (Sun): take in the dramatic natural features at Hiuramisaki Columnar Joint, get to know the fascinating history of Shinoridate Remains, browse the eclectic array of goods at Hakodate Morning Market, contemplate the long history of The Old Public Hall of Hakodate Ward, then make a trip to Hachimanzaka, and finally look for gifts at Kanemori Red Brick Warehouse. To see more things to do, photos, reviews, and more tourist information, use the Hakodate sightseeing planning website . Do a combination of flight and shuttle from Sapporo to Hakodate in 1.5 hours. Alternatively, you can fly; or drive. While traveling from Sapporo, expect somewhat warmer days and about the same nights in Hakodate, ranging from highs of 10°C to lows of 2°C. Finish your sightseeing early on the 24th (Sun) so you can drive to Noboribetsu. 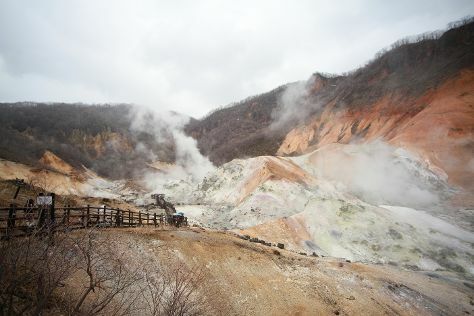 Perhaps the island's best-known hot spring resort, Noboribetsu has a long history of tourism. Start off your visit on the 25th (Mon): witness a stunning natural landmark at Oyunumagawa Natural Footbath, then explore the striking landscape at Jigokudani, then meet the residents at Noboribetsu Marine Park Nixe, and finally contemplate in the serene atmosphere at Katta Shrine. On your second day here, get in on the family fun at Noboribetsu Date Historic Village and then contemplate the waterfront views at Lake Toya. For where to stay, reviews, other places to visit, and tourist information, refer to the Noboribetsu travel planner. Traveling by car from Hakodate to Noboribetsu takes 2.5 hours. Alternatively, you can take a train. In November, plan for daily highs up to 9°C, and evening lows to 3°C. You'll have a few hours on the 27th (Wed) to wrap things up before traveling home.